The Costa del Sol is one of the best coastlines in Europe. This is a list of the top 10 best beaches in Malaga. Andalusia will count around 300 days of sun per year, the opposite amount you have in London. That’s why you will call this part of Spain the Sun Coast. The Malaga coastline is blessed with some of the best beaches in Spain, with the finest sand and long beaches. 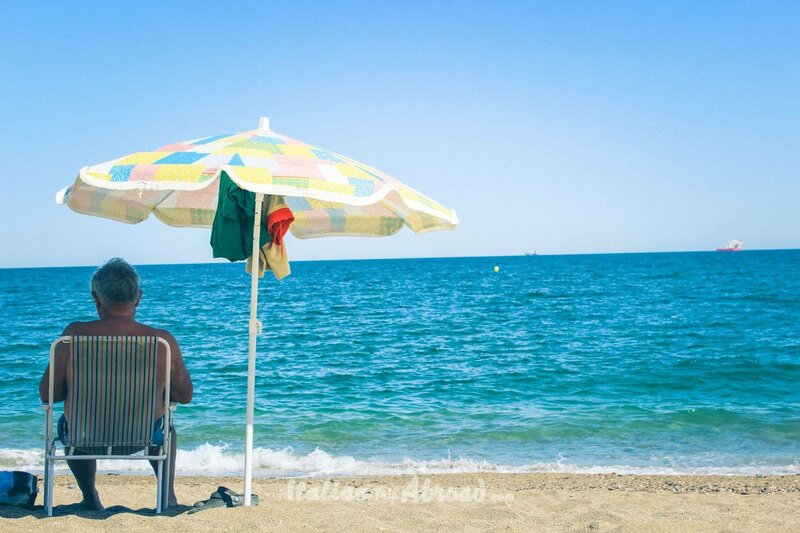 Discover the beaches of Andalusia, traveling to Torremolinos, Marbella, and Fuengirola. Live a hot summer in Europe and a warm spring break in Malaga. Wear your swimsuit and enjoy the lively nightlife of Malaga. All you need to know about the best beaches in Malaga is here! Here we go with the list of the top 10 beaches in Malaga and around. Plan to travel even just for a weekend in Malaga. Start from here your Tour of Andalucia visiting the best beaches in Andalucia. For a lot of people, Malaga is comparable to Barcelona. It is a paradise for expatriate. In your Andalusia itinerary, you need to plan a visit in Puerto Banus because it has some of the best beaches in Andalucia. This amazing beach is in Manilva municipality, in the provinces of Cadiz, just between this city and Malaga. It is not a long beach, mainly stony and amongst rocky outcrops. If you are renting a car and plan to head to Torremolinos driving, parking is really hard. Try to find a parking space on the top of the hill. Stop in Burian Beach, one of the Best beaches in South of Spain. Eat the best paella with Sangria and, relax an hour on the sandy beach. The wide range of fish and prepared seafood dishes make it the best option for fine palates. Take your drink and run to the beach. The temperature in Costa del Sol is really high, especially in the summertime. Do you know how to ask for a beer in Spanish? Una Cerveza porfavor! This is the top list of best cities in Andalusia. If you love Spain, you will also love our personal list of the best beaches in Ibiza. We tried to fill a full list of the best nightclub in the Spanish Isla Bonita. We are always talking with our friends about our best road trip in Spain. This one was absolutely epic and rich memories. It has made us want to come back to Andalusia. We are also thinking to live in Spain for a bit, acting like local and stay on the beach. Answering quite often questions like “What are the best beaches in Malaga”. Or suggestions to give away a map of the “best beach in Spain“. This is the reason why we are now getting out a complete and personal guide to the best beaches in Malaga. The guide of the best beach in Andalusia could be the next step for us. If you want to contribute to this guide, send us an email. Give us your personal reviews on some beach or upgrade this list. We are always open and also we are really happy to help you to plan your trip there. It has been really had to choose the 12 best beaches in Malaga for us. All the Costa del Sol is amazing and has some of the best beaches in the World for us. Playa la Malagueta, the Malaga city beach close to the centre. La Playa de la Malagueta is in the list of the Best beaches in Malaga and on the top of your Tour Andalusia. Malagueta beach in Malaga is the main coastline of the city. 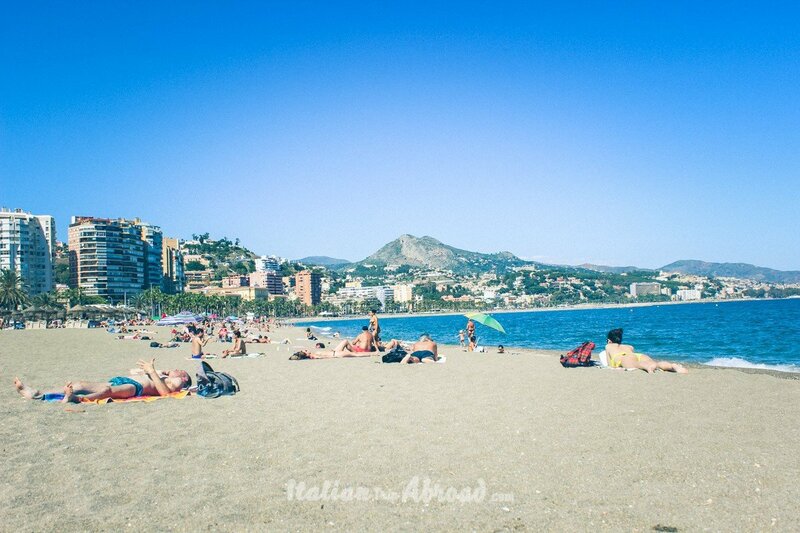 La Malagueta is the most beloved Malaga beach where all the people going after work. It is really crowded in the summer. Planning your Andalusia Itinerary you need to include this beach. It could be your first place to visit especially in the summertime when the temperatures go over the top. La Malagueta is close to the city center. In 10 minutes, going through the seaport and the harbor you will find the finest sand. The locals love this beach, a strip of sand of over 1Km length. If you don’t like to be too many hours under the sun. You can find a spot under the palm trees. Just on the side of the beach, there are few spots like an oasis in the desert. Malagueta is the first in our list of top 10 beaches in Malaga. It is looking like a South America beach and is the rich of beach bars. Just one minute away from houses, restaurants, and resorts. If you rent a car and want to park it close to the beach, try to go just in the direction of the Gibralfaro. Here you can find a spot for your car in the many tiny streets. It is easy to understand the directions, just point yourself behind the buildings on the seaside. The parking doesn’t cost too much, even if the area behind Malagueta is one of the poshest in Malaga city. If you want to park your rental car there, it will cost you just 1 euro for an hour. The parking is until 8 pm, after that time you can park for free everywhere. The beach of Puerto Banus in really close to Malaga. Situated in the city of Marbella, is one of the reach parts of Andalusia. As the local call the beach, it is playa Puerto Banus. Here you will find a lot of yachts, and it seems to be the Montecarlo of Spain for the concentration of millionaires. Puerto Banus is amazing and needs to be on the list of the top 10 beaches in Malaga. The beaches are really organized with all kind of water sports. Stroll around the coastline and visit it at the sunset for the best landscape ever. Stop by one of the dozens of chiringuitos on the promenade. Be ready to pay a little more, the prices are a bit inflated due to the reputation of the area and the visitors. It is easy to arrive in Puerto Banus from Malaga. By car, it will take you just 15 minutes from the city center. You can reach Marbella with public transport as well. One way with the bus will cost you just 1 euro and 50 cents. If you are on a budget, we advise you to visit just Purto Banus for a nice swim and a great walking on the promenade. Come back to Malaga for lunch or dinner, it could be really dangerous for your wallet. Between Baños del Carmen and La Malagueta, it is another beach awarded with the blue flag. 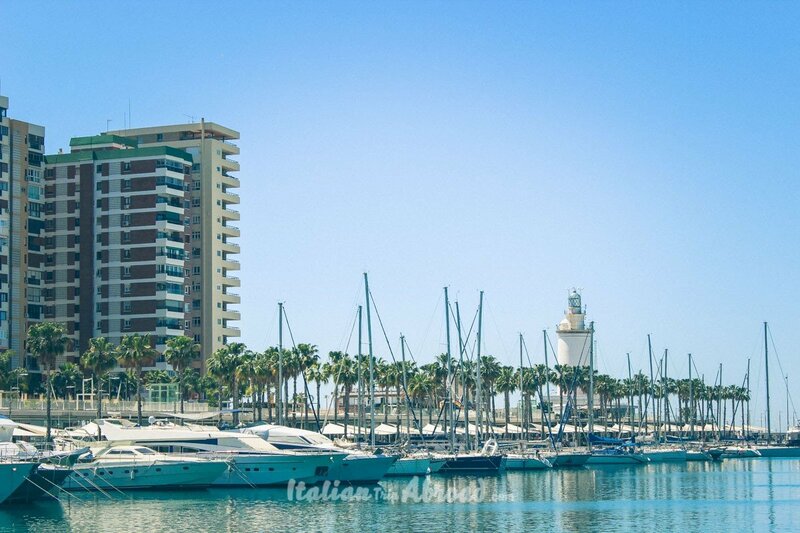 It is not really away from the city center of Malaga and rich in beach bars and restaurants. 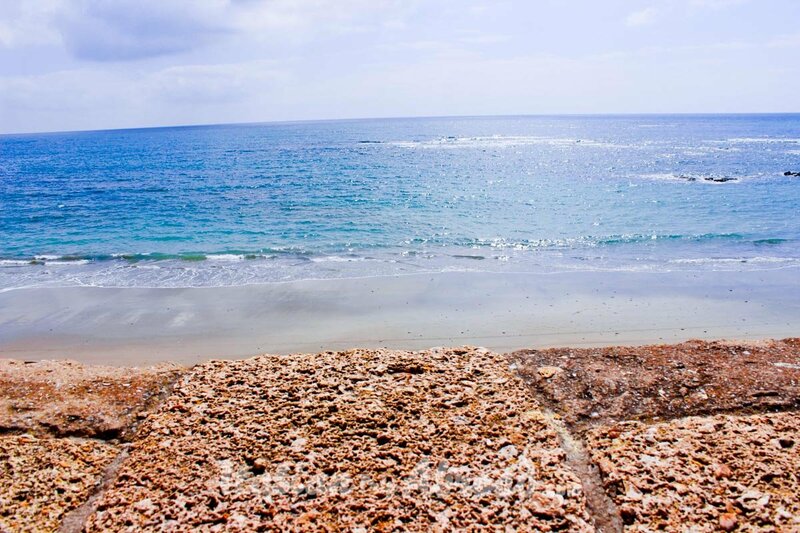 This beach is also not that far from Malagueta, the first beach on our list. All around the sandy beach, there is the Pablo Ruiz Picasso Promenade, over the years it has been regenerated. It is a long beach of dark sand. The beach is around 1 Km long. 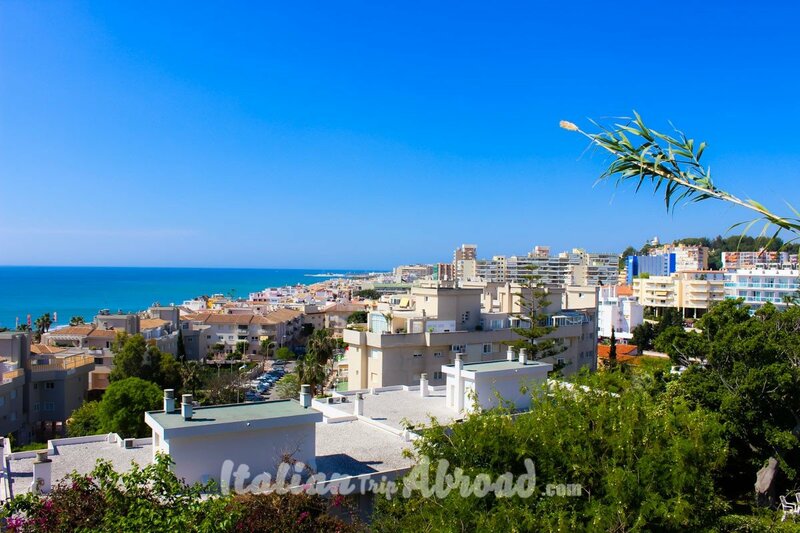 La Caleta beach Malaga is really close to the city centre. Just a few minutes away from the old quarter of the city. The beach is equipped with sunbeds and some watersports. All around the beach you will find luxury villas and mansions and amazing resorts. It is on the list of quiet beaches near Malaga and you will find a lot of families. The Misericordia beach Malaga is 10 minutes away from the city center, it is on the Carretera de Cádiz in Malaga. If you follow Playa de Guadalhorce you will find it between the Playa de Huelin. Playa Misericordia is another blue flag beach in Spain, it is a really long beach with a small width, just 30 meters and has quite often swell tide. Because this beach is close to the Malaga Seaport, it has been known by locals for the big waves as “La ola del Melillero”. Head at the Misericordia beach Malaga if you want to try the watersports and enjoy the rental services for hammocks and parasols. This is in the list of the Top beaches Spain, because of the clear waters ideal for snorkeling and spearfishing. Really well known by locals because really quiet and without tourists. It is an ideal spot for relaxing especially during the weekdays, on the weekend, in summer, it could be loads of locals and families. Put this place on your Malaga beaches map and visit it as soon. It has just one chiringuito, serving as restaurants as well. 30 minutes away from Malaga there is the small town of Fuengirola. This little town becomes very popular during the summertime, on the planned holiday time in the months of July and August. Fuengirola has the best beaches in Southern Spain and has one of the best beach towns in Spain. Over 7 Kilometers of sand divided into 7 beaches. It has similar amenities to South America beaches with a lot of Chiringuitos, shops, and restaurants. You will find all kinds of water sports and do a lot of activities. The promenade of Fuengirola is one of the longest in Spain, and it has the best beach in front of the region. Try also to find the best beaches Marbella, are really nice and if Fuengirola beaches are crowded you can find your spot just a few minutes away. The new five-star beach on the Malaga coastline. Cabopino beach is becoming one of the most popular destinations in Spain, in Summer it is overcrowded and the beach is just 1.5 Km long. Fine sand and awesome dunes give the sensation to be away from Spain. The dunes of Cabopino has been declared a national monument, and we suggest you check it out as soon. On the dune section, there is a nudist beach. Less than one hour divide Malaga to this beach, you can reach Cabopino from Marbella or Fuengirola in just 15 minutes, also by bus. We know is really hard to find this beach on the touristic guide of Andalucia, plan carefully your Andalusia itinerary, this is in the list of the best beaches in Andalucia and not all the Tour Operator are working on this area because of the lowest amount of accommodations. Give space to Cabopino on your Tour Andalusia bucket list. We invite you to visit Torremolinos, not just the beach, but also the town as well. It has one of the beautiful landscapes in the South of Spain. The beach in Torremolinos is a stretch of Sand of 7 Km divided into 6 beaches. Torremolinos is a town-resort, it is also one of the oldest and really well-known towns favorite by Americans and English tourists. On the promenade of Torremolinos and all around the rocks there is a wide range of hotels and restaurants with a beautiful sea view. In the hottest months of July and August, it is overcrowded, the price is going up and find park space is really difficult. If you are planning to spend a day trip here, be ready. Torremolinos need to be on your list of day trips, walking through the paseo marítimo or take just a minute walk. There are some small streets, close to the residential area where find parking is quite easy (not in summer, obviously), and somewhere you need to pay the ticket, just 1 euro for an hour until 9 pm. In some other streets, there are the white stripes on the surface where the parking is free of charge all the time. Plan to go to Torremolinos by bus, it will take just a bit longer but you don’t need to think about parking space and ticket fee and you will enjoy all the amazing seaside landscape along the Malaga coastline. The bus ticket will cost you just 1.50 euro and will pick you up from the main train station and bus station, close to Malaga city. The bus is running until 11 pm, with some changes just at the weekend where they will run until late at night. This amazing beach is close to the town of Nerja, is the favorite among locals. If you like to do snorkeling this is the place for you, but be careful, fishing in this area is banned, and thanks to this law the area is abounding of marine sea life, ideal for discovering the deep Mediterranean water. If you want to dedicate your holiday to water sport, the beach of Maro has a lot of opportunities. Kayaks available to rent, ready to take you around the alluring craggy coastline. It is considered one of the best beaches in Malaga, even if it is like 1 hour away from Malaga city. 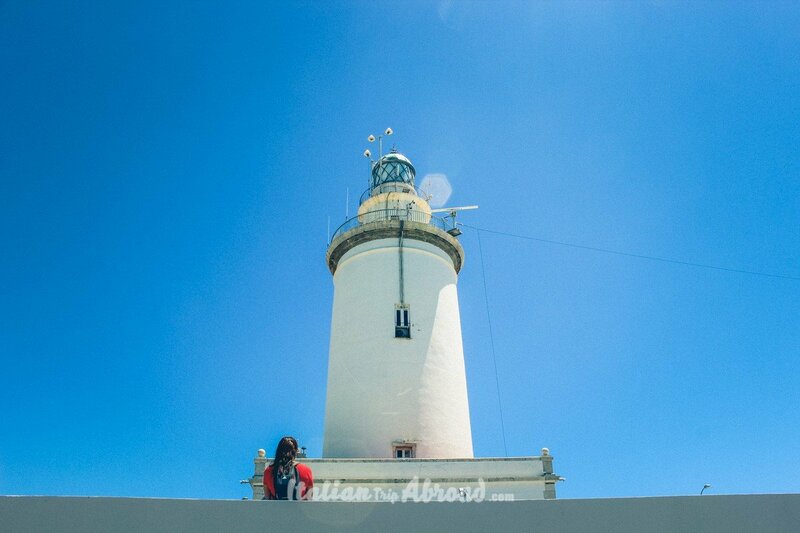 You can plan to visit Maro on a day trip from Malaga to the coastline in direction of Almeria. 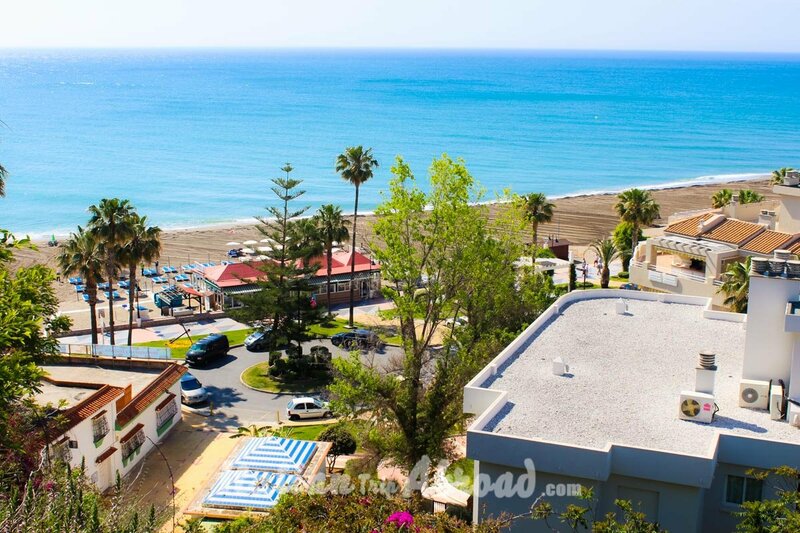 Maro beach is just a few minutes away from Nerja Malaga beaches. The tour Andalusia could have here a couple of days off because it is one of the quiet places on the Malaga side. Just a few minutes away from Maro beach there is Nerja, plan it in a day trip of the best beaches in South Spain. The little town of Nerja has some of the best beaches in the Malaga province. Burriana beach is one of the most popular and it is just less than 1 km long with an amazing landscape looking at the sea and at the back on a mountainous backdrop. Burriana beach is also one of the most equipped Andalusia beaches, with a big range of watersports available. You can easily rent pedalos, Kayaks and also Jet skis. You can rent even boat visits and guided travel from here. There is a big range of choice on the promenade, where also you can find a wide selection of restaurants, bars and tapas places. It is just 12 km away from Malaga city, it has a recognizable Arabic-style. That’s why the strange name of this beach. Bil-Bil has a dark sand beach and is really small. On the rock, you will find the Arabic Castle where the beach takes its name. Bil-Bil is around 20 minutes away from Malaga and is the quietest even in summertime, where beaches as Torremolinos or Marbella are overcrowded. You have some good options of where to eat, there are a few many good restaurants with Spanish specialties. This place is also not on the Tour Operator list, but you need to put it in your bucket list. 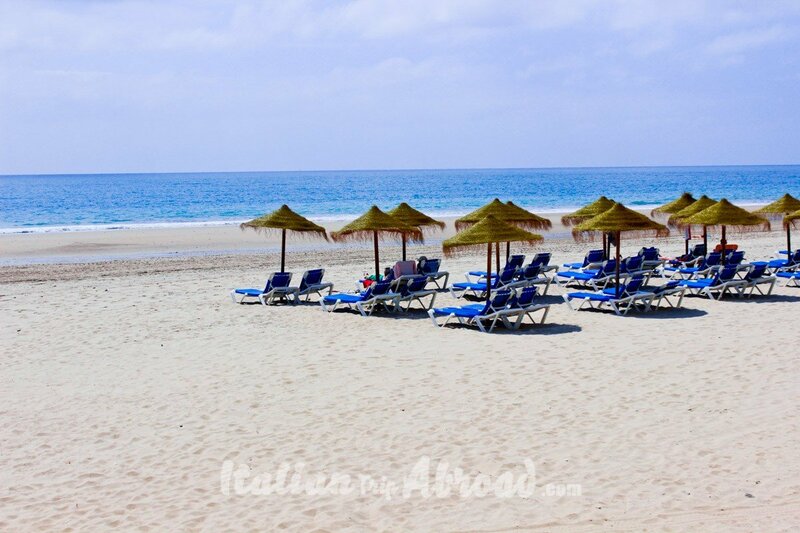 It is inevitably on the list of best beaches in Andalucia and on your Tour Andalusia pathway. This place answers you the most common question about “which is the best beach in Malaga”. Estepona Beach is absolutely the best and most organized. Estepona Beach is a really long beach a few minutes away from Malaga city. It is a sandy beach with some part of it full of shingle. Estepona is not just an amazing beach, but also one of the prettiest towns on the Malaga Coast. All the chiringuitos on the beach will cook fresh fish and seafood, the popular dish is the barbecued sardines, served fresh fished by locals fishermen. Estepona beach is really popular among locals, it has been known by travel tourists as well as people coming from the internal area of Granada. You can get here by car from Malaga city in about an hour, or using public transport with a direct bus from the city center. This is one of the most suggestive beaches near Malaga. The Waterfall into the sea close to Nerja Beach, is a must do in your Costa del Sol visit. It is a proper waterfall, going direct into the Sea. A spectacular natural landscape, unique and awesome. You can reach the Waterfall of Nerja, renting a Kayak to the near beach. In summertime this place is crowded, but worth to be visited. Take your go pro, or camera with you. If you think this list is not complete enough, we are on the same vision, there are always new places can take their part in the list of the best beaches in Malaga. Cut some of the best beaches in Malaga was hard, but we have tried to give some direction to who is planning the first trip in Andalusia. It could be really cheap if you don’t plan to rent a car, there is an efficient public transport, taking you just from Malaga city bus station. The price of the bus ticket is really cheap, some of it just cost 1,50 euro. The food is also really cheap. If you don’t plan to eat in an exclusive restaurant in Marbella or Torremolinos or more worst Puerto Banùs. Feel free to ask advice and suggestions about planning your road trip, and don’t forgot to read our guide on how to organise your road trip. I love the country of spain and have been to a vast portion of it. However, I have never been down to the Costa del Sol/ Malaga area. That is crazy that they have 300 days of sun…I love summer and am definitely a child of the sun! I often talk with my family up in Leon, in Northern Spain and they are always talking about Maro Beach so I am definitely going to have to explore that amid all of the other best beaches in Malaga that you mention! I have only spent 1.5 days in Spain (in Barcelona), so I have never had the pleasure of visiting what appears to be some truly amazing beaches! They all look like an amazing place to relax and play in the water. My kids would really enjoy this area. It really looks amazing and especially with kids, it’s a quiet area where families can enjoy. Those are definitely amazing beaches. I wouldn’t be surprised if I can’t control myself and just rush into the water. Hehehe! We have some similar beaches like that here in the Philippines. Yes, I can completely understand if you want to rush into the water. We are thinking to do a trip to Asia, and the Philippines look nice to come. I am not a huge “sit on a beach” girl, but I love looking at beaches. I also love the cafes and bars and ice cream stores that seem to be all around European beaches, especially in the south of Spain. As I look out my window at the 7th day of rain, I would love to visit just one of these beaches. The photos are beautiful. 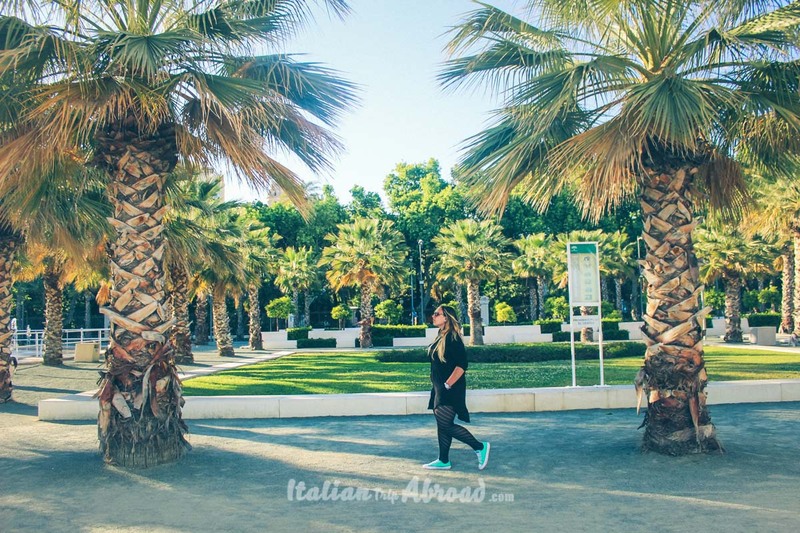 Very helpful post, especially for those who plan to visit Spain in summer. Among all the beaches you mentioned which ones are far from the civilization? I love to swim and sunbathe without seeing any building! These are some really beautiful beaches. The only one I’d heard about before is Torremolinos because it was featured in James Michener’s novel, The Drifters. Oh, those look lovely, but unless I am very tired and want to relax, I cannot stay on beaches long. Prefer to do something active. Wow, so many beaches! It would make a fantastic road trip, jumping from one beach to the other. Burriana beach looks stunning with that soft beach and mountain backdrop! Wow. Plenty of beaches around Malaga area. Would love to get there, get a beer, relax, sunbathe and watch the sunset throughout the day. Last year in August I was there in Andalusian region driving through the white villages. Well I was driving from Granada to Seville I took a detour and I reached Malaga. 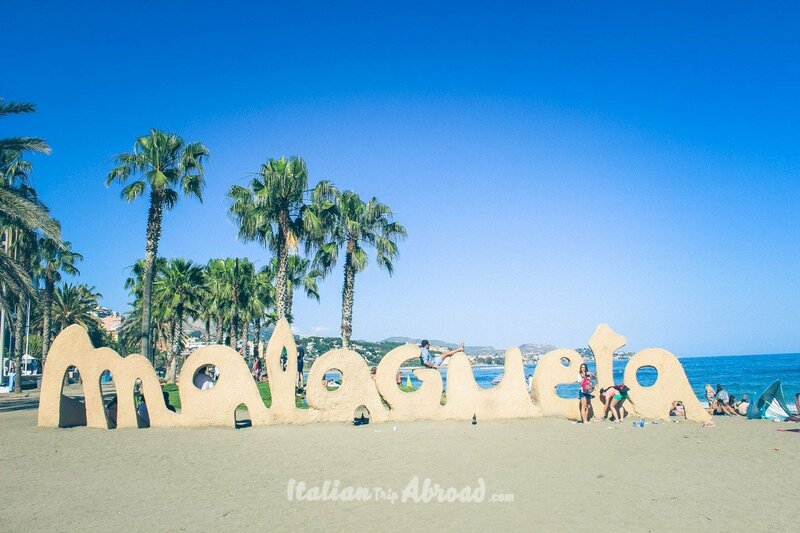 While in Malaga I made sure to visit the best beach as you have mentioned the Malagueta Beach. I was not having much time so I just spent the day or two near the beach and then I headed to Seville. However I love the list that you have shared here, I was not aware of most of these beaches. This has put me in the mood for summer again! I love Spain, and not seen enough of Malaga. 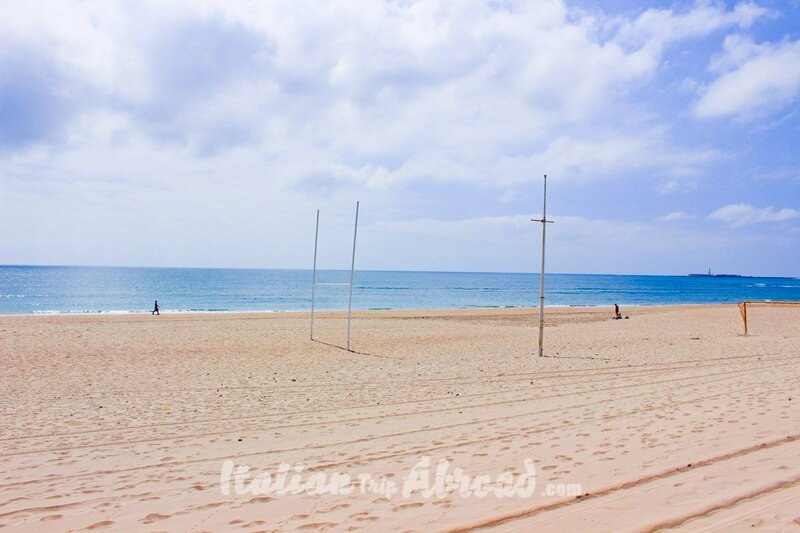 Torremolinos is a lovely beach, but so is Cabopino by the looks of it! Yes, Andalusia is great, look amazing for a summer escape but also for the Winter. The Sierra Nevada is really close to Malaga, is just down Granada. We love to be on the beach with the sun! We can understand your point of view. I have always heard about the sea and sand in Spain, but it is for the first time I read about such a detailed guide about the beaches. All the beaches look gorgeous, but the Burriana beach and Playa De Chullera caught my fancy. Would love to explore all of them. Thank you for passing by. You definitely need to go there and enjoy the beaches! Quite an interesting list of best beaches in Spain. Haven’t been to this part of Spain, I would love to explore Malaga though. The sunny pristine beaches is always a dream come true for me. Spain is amazing! Malaga is absolutely a city looking at the future! I think I need to get a passport soon. I want to check out these amazing beaches. Absolutelly, go and check those amazing beaches by yourselves. Spain is amazing and the weather is always nice. 360 days of sun in Costa del Sol. I am so jealous you have visited all these beaches and they look so beautiful. I need to start reconsidering my next trip, Spain looks like my next destination. Spain is one of our favourite destinations. I went to Andalusia 11 years ago and I miss it, it’s an extreme place full of warmth and beauty, you made me want to come back! You have to come back Cristina! We will see you in Malaga soon! I’ve never been to this location before. However, I would loooove to visit and one day get to see all these beaches in person. Alexandra you have to go! Absolutely! Oh, great! We will check out Queensland, thank you. I love discovering new beaches around the world. It’s amazing how different they all can be. Yes, we love it too. Costa del Sol have some of the best for us. Seems that you have the complete list already. The beaches and scenery is super lovely. I think I know where to go this summer already. Yes, Malaga is full of amazing beaches. Go there, we kindly advice it. OMG! Look at that beaches!! That’s paradise right there. I’m in love!! Already planning my next vacations. I love Spain and went there last Dec, simply stunning and was fascinated by the food and the culture and the buildings. However, one thing I didn’t really explore are the beaches, what a shame. Only been to a beach called Peniscola. Would very much love to explore Malaga. Probably another time as I feel I will certainly go back for another slower pace visit. Sounds like a perfect Summer destination to visit! Thank you so much for sharing these amazing list of wonderful places. I loved Malaga when I went! This post makes me want to get back to Costa del Sol as soon as possible!!! Living on the coast most of my life I love visiting different beaches. Thanks for so many great ones to consider. These beaches look heavenly. Especially sitting in this brutal cold climate. I so want to be here! All of these beaches make me realize how much I need a vacation! You give such a great run down of the best available in Malaga and I am adding this area to my bucket list!